Discussions and Comments. Inserting Images. Add photos, YouTube and more . To start a Comment, scroll to the bottom of the discussion where you want to add your comment and then start typing in the comment box. 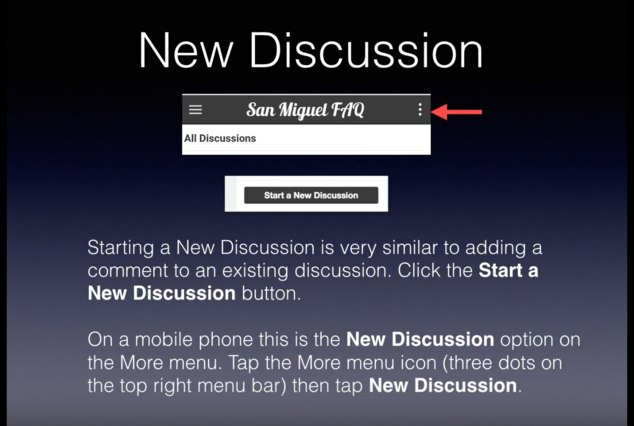 To start a new Discussion, tap or click the “Start a New Discussion” button near the top left of the page just under San Miguel FAQ on a computer. 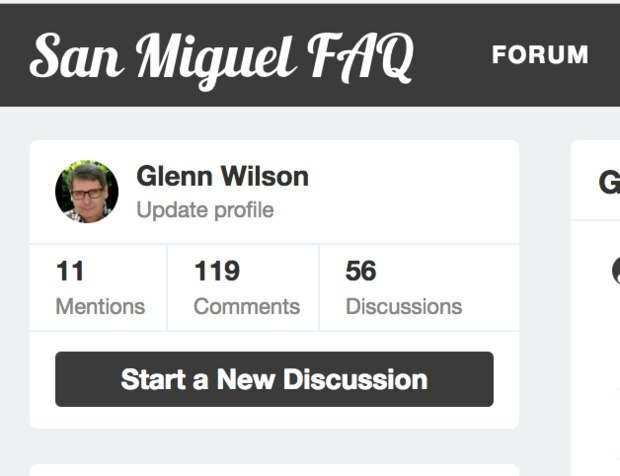 On a mobile phone it is the "New Discussion" option on the "More" menu (3 dots near the top right).. Fill in the title and select a category. The body of the discussion works about the same as a comment. For more on using @ mentions in a comment or discussion, see: Direct Messages and Mentions. The insert media icon can be used to embed audio and video from YouTube, Vimeo, Wistia, SoundCloud, Vine, Twitch, Giphy, Imgur and Voxer, plus direct links to MP3 and MP4 files. I would like to nominate, The Rug Hook Project, Las Rancheritas for the Oct. charity. http://rughookproject.com . They are a part of Mujeres en Cambio. These amazing crafts women, who are a self governing cooperative, live in Augustin Gonzales. They are primarily self sustaining but they have many expenses: show fees, transportation, material transport, advertising and more. Advertising their Rancho Tour, a very popular cross cultural experiential is particularly expensive. However, this brings people to their community and store so they can sell more of their folk art rugs. They have been in existence for over 20 years and have a track record using every peso towards their cooperative while improving the standard of living for their families . I'm going to make a New Discussion with this content and add the video from the website.